Category Archives for "Children & Teens"
Puberty. Need I say more? This time in a young boy’s life turns his entire world upside down. From a clean cut face, to hair growing in spurts all over the place. Generally, not in even proportion either. From a normal little boy’s voice, to squeaks and squawks as it emasculates into a man’s voice. And yes, from thinking girls are icky,, to thinking about them morning, noon, and night. In this area, the boys mind must take control of his body, or his body will take him places he is not yet mature enough to go. As a pre-teen 11 – 14 year old boy, if he is considered a, “mama’s boy,” then he may try to over compensate by taking on more physical athletic sports than he can handle. After all, he has a reputation to showcase, and then uphold to his peers. However, when he comes home, he gets to be all lovable and sweet in the bosom of his Mommy again. Unfortunately, with the vanishing of traditional home governments and their standards for living, many young teen age boys and girls are left to fend for themselves as to what they think is right for them with no absolutes at all. Everything is relative. Thus, many young boys may not have a strong male figure to emulate, but are forced to make up their own minds given what is fed to them in school and the media instead of what is lived out in the home. However, our young men of tomorrow will persevere, somehow, and become all that he is meant to become. Our job as parents is simply to guide them in the right direction as best we can with what we are given. Parenting is not easy. Don’t get startled with this amazing statement. Ask mothers and fathers of a child and they would, in all probability, support this assertion. Child health is always of primary concern to all mothers and fathers. And when it comes to eating, mothers are most likely to vouchsafe that the child does not eat healthy and balanced food in spite of coaxing or sweet-talk. This is, by and large, a worldwide phenomenon. Let us now consider the eight ways of helping your child eat healthy and balanced food. The focused age-group for this is 2-12 years or extendable till the age 15. Firstly, try to involve your child when you are planning about and cooking meals. Ask your child about his or her choice to make sure he or she knows the food items well. Secondly, ensure that the child takes breakfast regularly. It will raise the energy level for school and home work. For breakfast, give soft or light items such as popcorns, dry fruits, yoghurt or something that the child would definitely relish in the morning. Thirdly, cook all food items with less oil and salt. Both oil and salt are considered to be detrimental to the health of children as well as adults. If possible, prefer to consume baked or roasted food items, not fried ones. Fourthly, coax your child to eat 4-5 times every day. There should not be a big gap between two meals. Also make sure he or she does not eat too less or too much at one time. Let it be balanced diet. Nevertheless, baby healthy diet tips differ from this that you can learn here in another post. Fifthly, allow the child to decide sometimes only on the quantity of snacks to eat at one time. Remember, the child will never starve in the growing age, unless angry. Also, teach the child to eat slowly. This will help him or her to relish the food item better and also facilitate easy digestion. Sixthly, try to make a healthy recipe for children with good variety of vegetables including green and leafy ones. It will increase the level of calcium and iron content in the body. The simplest way of goading the child to eat these vegetables is by setting an example. 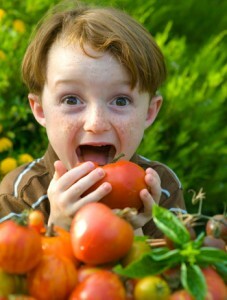 If you demonstrate liking for these vegetables, the child will do so, sooner than later. Inversely, if you keep on eating spicy and oily food items, the child would certainly demand that, too. Seventhly, remember that the entire family needs to consume the same meal in the presence of the child. When you eat something different, the child is most likely to show displeasure or revolt. Eighthly, and more importantly, avoid sitting on the sofa watching television while taking meals. It will invariably divert your attention on what your child’s eating, both quantity and manner. Above all, keep in mind that proper growth and development of the child needs to become a top priority. Consult your family physician to know more about the calcium, protein and more in food items that can make your son or daughter healthy. Remember that proper child health cannot be achieved in a day or two. It is a long and continuous process till he or she reaches the age of 15 years and becomes self-reliant.